Ruth Colleen Jorgensen Berrett, strong, brave and loving mother and grandmother passed away at her home, in St. George, Utah, with her family by her side, on Wednesday, March 22, 2017. She courageously fought cancer for over three years. She will always be remembered for her kindness, unconditional love for everyone she met, sense of humor and amazing stalwart spirit. Colleen was born Nov. 30, 1929, in Lehi, Utah, to Mary Lillian Knight and Joseph E Hackett. She was raised by her loving stepfather William Mortensen Jorgensen and had six siblings; Dickie Hackett, Janet Adams, Judy Taylor, Barbara Roller, and Billy Jorgensen. She grew up in Salt Lake City, Utah. Colleen graduated from West High School and attended college at the University of Utah. She was a member of The Church of Jesus Christ of Latter-day Saints and her favorite calling was camp director. She worked at St. Mark’s Hospital as a unit secretary in ICU for 22 years. 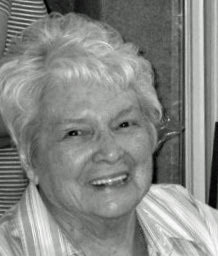 She enjoyed bowling, playing cards, cross-stitching and crossword puzzles. She loved spending time with family and expressed how proud she was of her children and grandkids who she held near to her heart. She married Richard J. Berrett on March 20, 1952, in Salt Lake City, Utah. She was the mother of five children who she loved dearly. She was preceded in death by her brother, Dickie Hackett, and sister, Janet Adams. She is survived by her children: Kris Spevak (Layne), Rick Berrett, Shelly Johnson (Alden Jr.), Barbara Berrett, and Becky Andrews (Todd); 12 grandchildren; and 15 great-grandchildren. Funeral services will be held Saturday, April 1, at 2 p.m. at the Metcalf Mortuary Chapel, 288 W. St. George Blvd., St. George, Utah. Visitations will be held Friday evening from 6-8 p.m. and Saturday, prior to services, from 1-1:45 p.m., both at the mortuary. In lieu of flowers, please send donations to Huntsman Cancer Foundation at www.huntsmancancer.org/donations or mail to Jon M. Huntsman Center at the University of Utah, 1825 S. Campus Drive, Salt Lake City, Utah, 84112.